South African War Memorial. Thomas Eyre Macklin (1863-1943). Dated 1907; unveiled 1908. Percy Street, Newcastle upon Tyne. Photographs and text by Jacqueline Banerjee, 2011. [You may use this image without prior permission for any scholarly or educational purpose as long as you (1) credit the photographer and (2) link your document to this URL in a web document or cite the Victorian Web in a print one. The bronze Victory (recast in the 1970s, and now with fibreglass replacement wings) site on a hexagonal ashlar obelisk bearing a bronze lion's head (a symbol of strength and fortitude) over bronze and copper fasces (a symbol of power and rule); then the inscription (see below). Round the base, copper panels with bronze shields listing the names of the fallen; bronze oak-leaf garlands; and a relief panel of a war scene to the rear. 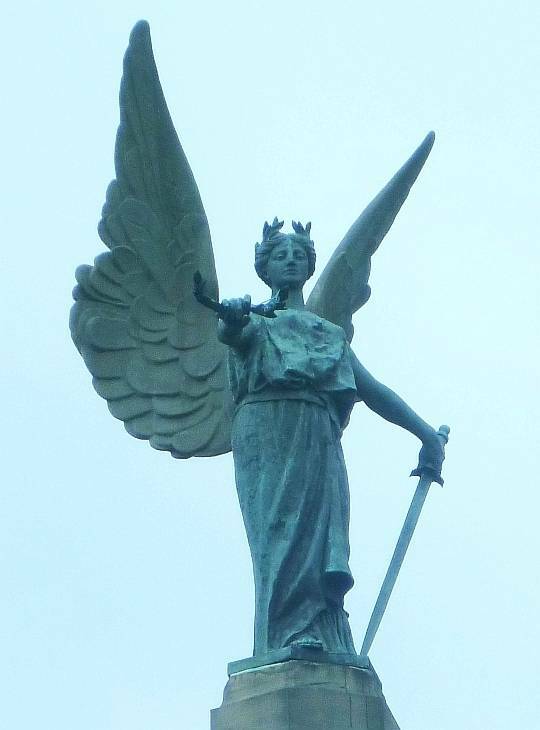 More strikingly, to the front, a bronze crowned figure representing Northumbria reaches upwards towards Victory, with a military standard partly draped over one arm. Macklin, the son of a Newcastle landscape painter, had studios both in his hometown of Newcastle and in London. He was better known later in life as an artist, particularly as a portrait painter and illustrator (see Usherwood et al. 329). This is probably his most important sculptural work. It certainly "dominates the skyline" in this part of Newcastle (Grundy 494), and is powerful too at close quarters. The raised words on the front read: TO / THOSE WHO / DIED / IN THE / SERVICE OF / THEIR COUNTRY. On the rear, the inscription (since called into serious doubt by Wilfred Owen's war poem on the subject) is: DULCE ET DECORUM EST PRO PATRIA MORI. 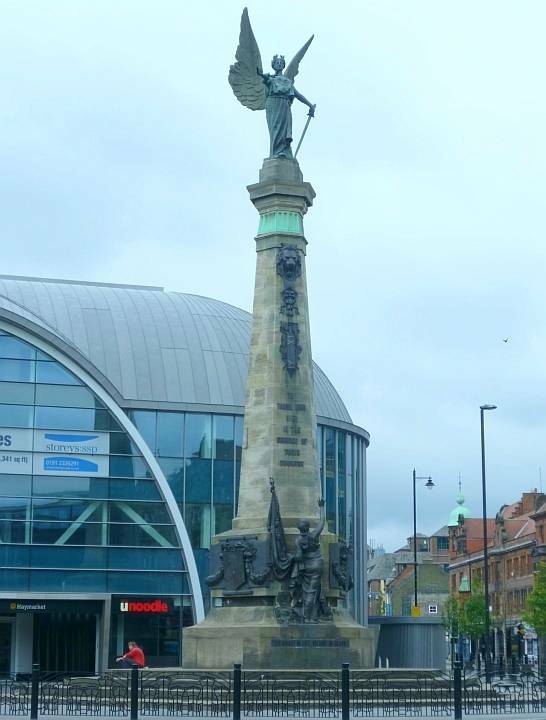 When the memorial was unveiled, however, the Lord Mayor of Newcastle said it was "'a thing of beauty' and 'an incentive to all to put their country's claims as one of the first objects of their lives.'" 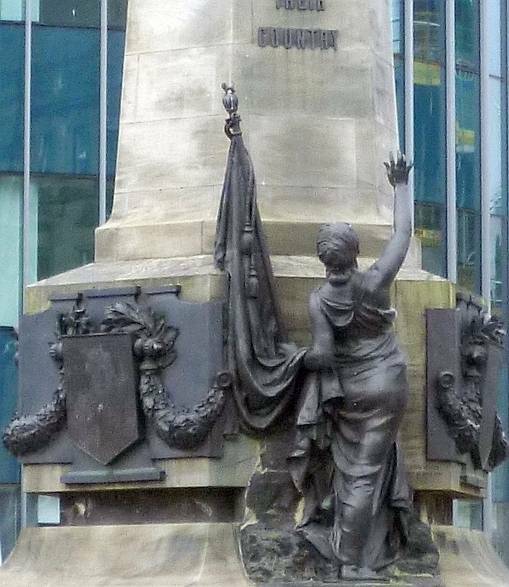 The monument has been praised, more recently, for its "grandiose dynamism" (both quotations come from "South African War Memorial" and are also in Usherwood 131). John Grundy, et al. The Buildings of England: Northumberland. London: Penguin, 2nd (rev.) ed.1992. Usherwood, Paul, Jeremy Beach and Catherine Morris. Public Sculpture of North-East England. Liverpool: Liverpool University Press, 2000.